Although glomerular hyperfiltration is common in early diabetes and considered a risk factor for later diabetic nephropathy, the mechanisms underlying glomerular hyperfiltration have not been fully clarified. The authors identified a novel mechanism of acute hyperglycemia–induced hyperfiltration in which increases in luminal glucose at the macula densa upregulate the expression and activity of neuronal nitric oxide synthase 1 (NOS1) via sodium-glucose cotransporter 1 (SGLT1); this blunts the tubuloglomerular feedback (TGF) response and promotes glomerular hyperfiltration. This novel SGLT1-NOS1-TGF pathway mediates the glomerular hyperfiltration observed in response to acute hyperglycemia. These findings establish a critical role of macula densa NOS1 and SGLT1 as key determinants of, and potential therapeutic targets for, acute hyperglycemia–associated glomerular hyperfiltration, and possibly for diabetes as well. Background Glomerular hyperfiltration is common in early diabetes and is considered a risk factor for later diabetic nephropathy. We propose that sodium-glucose cotransporter 1 (SGLT1) senses increases in luminal glucose at the macula densa, enhancing generation of neuronal nitric oxide synthase 1 (NOS1)–dependent nitric oxide (NO) in the macula densa and blunting the tubuloglomerular feedback (TGF) response, thereby promoting the rise in GFR. Methods We used microperfusion, micropuncture, and renal clearance of FITC–inulin to examine the effects of tubular glucose on NO generation at the macula densa, TGF, and GFR in wild-type and macula densa–specific NOS1 knockout mice. Results Acute intravenous injection of glucose induced hyperglycemia and glucosuria with increased GFR in mice. We found that tubular glucose blunts the TGF response in vivo and in vitro and stimulates NO generation at the macula densa. We also showed that SGLT1 is expressed at the macula densa; in the presence of tubular glucose, SGLT1 inhibits TGF and NO generation, but this action is blocked when the SGLT1 inhibitor KGA-2727 is present. In addition, we demonstrated that glucose increases NOS1 expression and NOS1 phosphorylation at Ser1417 in mouse renal cortex and cultured human kidney tissue. In macula densa–specific NOS1 knockout mice, glucose had no effect on NO generation, TGF, and GFR. 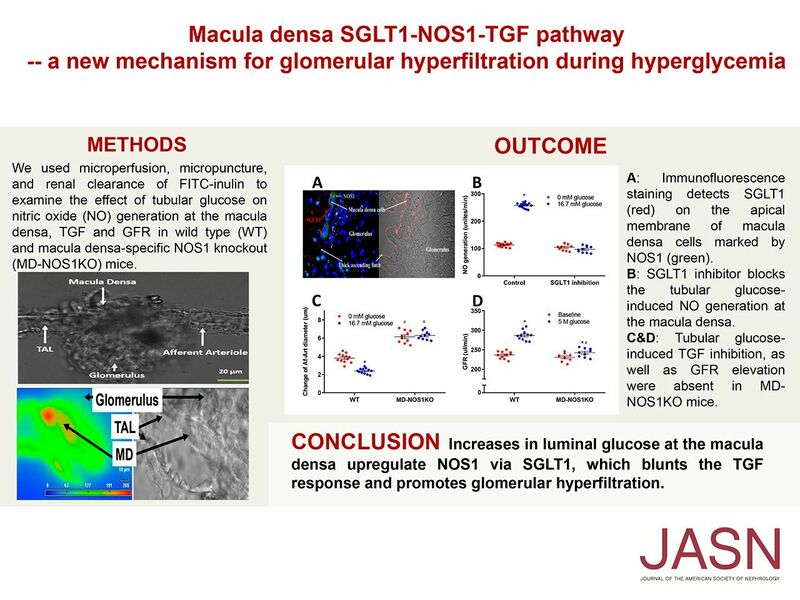 Conclusions We identified a novel mechanism of acute hyperglycemia–induced hyperfiltration wherein increases in luminal glucose at the macula densa upregulate the expression and activity of NOS1 via SGLT1, blunting the TGF response and promoting glomerular hyperfiltration.